The only blog giving you all Olympic spandex, all the time, every two years. HELLO LONG LOST FANS AND FRIENDS OF OLYMPIC SPANDEX! It's been a while, but I have not forgotten about you, nor have I forgotten about our shared interest – #olympicspandex. I am SO excited that the Rio games kick off this Friday, yet excited to enjoy them in my Zika-free home. Want to know another thing that I am excited about? 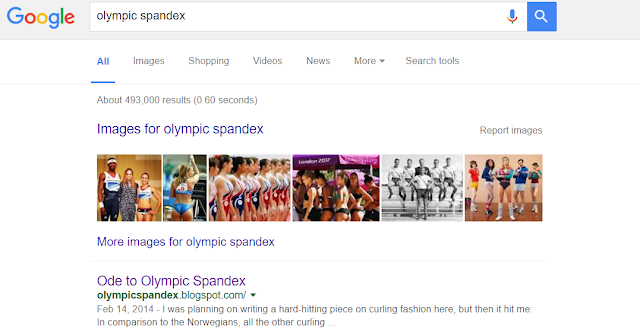 Our little blog remains the NUMBER 1 search result for "Olympic spandex" on Google. I feel like I've won the gold medal in the SEO Olympics! I was planning on writing a hard-hitting piece on curling fashion here, but then it hit me: In comparison to the Norwegians, all the other curling teams look like they are going grocery shopping on a Sunday morning. I know that I am always pushing for more red in our national attire, but blaaaaaaaaaah. They even look bored WEARING this. Seriously. Stopping at the store on the way home from the country club. Ok, we're getting a little better. Some graphic interest. I would expect at least as much from a curling nation such as Canada. Longtime readers will recall that I was a big fan of this Russian print that was also used during the 2012 London Olympics. Still a fan, and I appreciate that they are learning from the Norwegians. I admit to often being a slave to marketing. Generally this takes the form of buying any mascara that claims to make my lashes look big and fake. This week it took the more cost-effective route of inspiring a fascination of and love affair with ski jumping. It's really no surprise that I am so taken with ski jumping. Flying is awesome, and they do it in spandex. There is nothing not to love here. Let's take a look at some of the best and worst in ski jumping fashion, shall we? I have mentioned before the difficulty I have with other news outlets living inside my brain. Being a one spandex-clad woman blogging operation, sometimes I don't get things in writing as quickly as I am thinking them. Thus, many have beaten me to the "Johnny Weir Sochi fashion" punch. JDub is truly owning the Olympics. His commentary never fails to amuse (on Canadian ice dancer Tessa Virtue's dress he said Sunday, "I love that she's wearing a costume inspired by Russian royalty, and a little bit of Faberge"), and his outfits have been OFF THE CHARTS AMAZING. Your first course of action at this point should be to immediately follow him on the 'gram. He's been posting semi-daily fashion selfies. Your welcome. I have to admit that I'm confused by Day 0 of the Olympics. When people ask me why competition starts prior to the Opening Ceremonies I respond confidently that there is just too much to fit in. People tend to believe me because I have positioned myself as an expert on most things Olympic, but I'm pretty sure I made that up. Regardless, we got an extra day of spandex and I am here to break it all down for you. Figure skating is truly the golden sport when it comes to wintertime Olympic spandex. With the introduction of the team event, there are even MORE outfits to be worn, and this fills our cold, judgmental heart with pure joy. Those hips, that muscle tank, and then he takes his pants off... I'm keeping an eye out for this one in Sochi. Cool Runnings: One of my all-time favorite movies and the best (maybe only) big screen bobsledding around. Based on the true story of the first Jamaican bobsled team trying to make it to the winter Olympics. Miracle: Miracle tells the true story of Herb Brooks (Russell), the player-turned-coach who led the 1980 U.S. Olympic hockey team to victory over the seemingly invincible Russian squad. The Cutting Edge: She's a rich and refined pairs figure skater whose prima donna attitude has her skating solo. He's a brash, blue-collar hockey champion with a new injury and no future. With nothing in common but their dream of reaching the Olympics, Kate and Doug are each other's last resort. Reluctantly, they join forces, but its not long before the barbs – and sparks – start flying as the unlikely pair skate towards the opportunity of a lifetime: a chance at a medal...and a chance at love. I have been a dedicated supporter of spandex since birth, and spent much of my childhood in an assortment of floral unitards (I was in the circus). I own upwards of 7 leotards (not leotards left over from my youth – leotards purchased within the last decade). I only care about #thesports during the Olympics. Contact Ode to Olympic Spandex at olympicspandex@gmail.com.